In Dynamics365 there are many standard events on Forms, similarly like standard methods on different node of form. Let’s see how we can use ‘OnInitialized’ event on Form Data source and use form object into a different call. 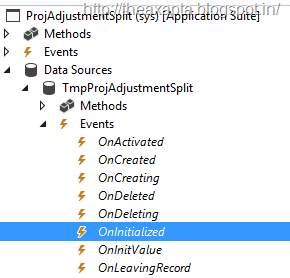 Scenario: On from ‘ProjAdjustmentSplit’ I want to enable/disable a field on certain condition. As D365 urge to not to customize ant standard object than write EventHandlers to achieve your requirement. In earlier version of AX, we simple write this logic either on Form Active method or from DS init method. Here we have to use EventHandlder for the same. Here we will use ‘OnInitialized’ method and will write an eventHandler for the same. Step 2: Create a new class and paste this method. Step 4: After above declaration now wrtie your actual business logic. Project management and accounting > Periodic > Transactions > Adjust transactions and click on Adjust button to test your code. Note: Try to add use the same code on your form and add more field using formConrol. Make sure you mark this control AutoDeclare = Yes on Form design. Get complete code here.